No. I’m not switching to Dakota spirituality. This is an image printed on my memory. A painted rendition appeared on the cover of a book that my father gave out when he was clinical director of the hospital that served the Sisseton-Wahpeton Dakota bands. I was in grade school. 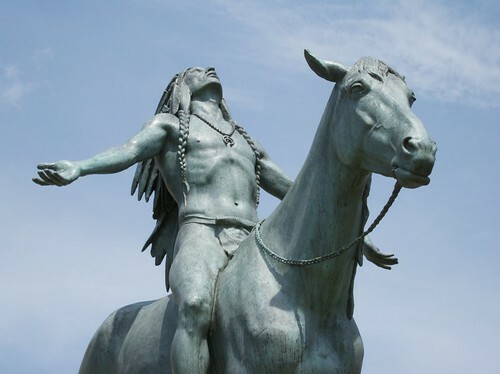 It’s called “Appeal to the Great Spirit” by Cyrus Edwin Dallin (1861–1944). Unlike the Force (and some Eastern religion), however, the Great Spirit is not “an energy field created by all living things” (Obi-Wan Kenobi). Rather Wakan Tanka is itself the creative force from which the world proceeds. This is how the Great Spirit manifests “in” everything. Dallin imagines his sculpted Dakota warrior praying to the Great Spirit because he’s been defeated by the U.S. Army. Yet there is no tension in Wakan Tanka, no teetering balance between male and female, yin and yang, light and dark, good and evil. I cannot imagine this warrior, like the psalmist, expecting the Great Spirit to repay the invaders “with the recompense with which [they] have repaid us” (Ps 137:8 RSV). Nevertheless I like this image of utter abandonment to that which is greater than oneself. The man’s gesture is one of openness to the sky and fearlessness of death—should it come. Dakota traditionally buried their honored ones on elevated platforms so the carrion birds could hasten their union with the sky. If all spirits emanated from the Great Spirit then to the Great Spirit they returned in death. The purpose of Wakan Tanka prayer was not to petition assistance, but to find one’s point of participation in the Great Mystery. For example, one didn’t pray for rain. One set oneself to sense, to enter into the conditions that yielded rain. One prayed rain. I don’t mean to idealize Native American religion. I confess to idealizing the statue’s readiness, however. “Maranatha,” my own God-breathed spirit cries out (1 Cor 16:22; Gen 2:7). “Come, Lord Jesus.” But no one is chasing me. Imminent death does not prompt my prayers. Rather, what is necessary is that same abandonment to the Creator, that readiness for communion on his terms, when I’m lonely. Alone. Misunderstood. These are my driving fears. They have been since I was a child. I do not need to be carried off by an invading army to become overwhelmed by my sense of isolation. My land does not need to be stolen for me to feel without home. This fear is my death before death (Mark 8:34; Rom 8:13). This is when idealized bronze arms flung wide must give way to a practical, in-the-flesh discipline of trust. Instead of blessing God for avenging me against those who have abandoned me. . . . Instead of requesting the removal of the fear, which is a very real indicator of cracks in relationship. . . . Instead of begging God to fill the emptiness with people, I must find my point of participation with him in the midst of the mystery that is our relationship. I must set myself to sense belonging, to enter into the conditions that yield belonging. And then I must trust that my very personal God prays belonging back (Heb 2:17). This entry was posted in Centering, How Prayer Works, Types of Prayer and tagged alone, Appeal to the Great Spirit, Cyrus Edwin Dallin, Dakota, Eastern religion, Force, God, Great Mystery, Great Spirit, maranatha, misunderstood, Native American, Obi-Wan Kenobi, prayer, sculpture, SD, Sioux, Sisseton, Sisseton-Wahpeton, sky burial, South Dakota, trinity, United States Army, Wakan Tanka, Yoda. Bookmark the permalink.